We got this Pocket Etch-A-Sketch way before it gained its newfound political celebrity status. 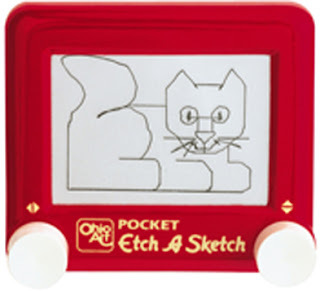 The Pocket Etch-A-Sketch is big enough for keeping two little hands (and even big hands) busy. It can capture their attention quickly because it is a great hand-eye exercise. Making a line is easy (the hook) but making an intentional shape (the keeper) is more challenging. "More challenging" is good. This is a good example of something that your child can keep doing if he has started something that he can't easily stop (ie. video games). No school bus driver will have a rule against pocket-etch-a-sketches like they do with handheld video games. And while it's not the size of a marble, it's doubtful that you wouldn't want your child to bring this along outside. Hey, it's still smaller than an iPad. I use things to keep my students busy too. This looks like a great tool.